Download a (free) copy of our ebook 8 interviews with successful intranet managers to learn real-world intranet tips and insights. William Amurgis stands eight feet tall, has biceps the width of oak tree branches and has a booming voice louder than a fog horn. He’s a giant of intranet management. Literally. Well, figuratively, actually. William describes himself as completely average, yet his team’s intranet accolades tell a different story. 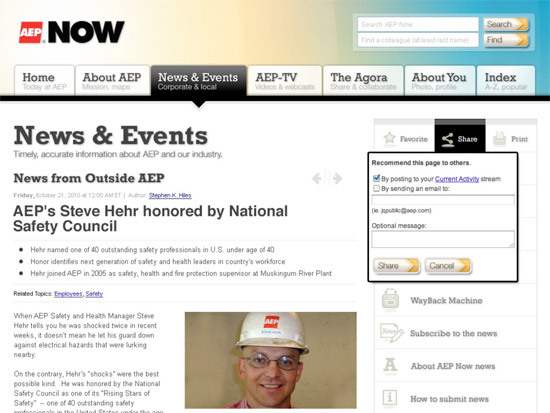 The AEP intranet won the Nielsen Norman Group’s annual Intranet Design Awards in 2007 and Step Two Design’s Intranet Innovation Awards in 2009. William speaks regularly on intranets and when I interviewed him, he had just returned to the office from one of the many presentations he gives at IABC (The International Association of Business Communicators) meetings. “I’ve had my fair share of pats on the back and arrows in the back,” William tells me. For all his team’s successes, he’s lost plenty of battles along the way and has had to learn the virtue of patience. He’s learned to sometimes take the back seat and let culture bring the changes he’s seeking, rather than forcing leaders to change before they are ready. William Amurgis built his first intranet in 1995, before the term “intranet” had gained the tremendous popularity it enjoys today. He remembers chatting with a few buddies in the IT department and saying, “Hey, we do this on the web, why don’t we do this internally?” That was a big jump in 1995, back when plenty of companies didn’t even have public websites and most computers had about the same processing power as my microwave has today. William’s intranet career is the story of fighting for a vision — a vision of an intranet so well-designed people simply can’t get along without it; an intranet that is the warm and inviting online landscape where employees complete their work with ease; an intranet that is the cultural glue of a company. William even avoids referring to “users” because he feels it’s too impersonal a term for his colleagues. But throughout his intranet journey William has encountered people who didn’t share his views and he has lost some battles along the way. 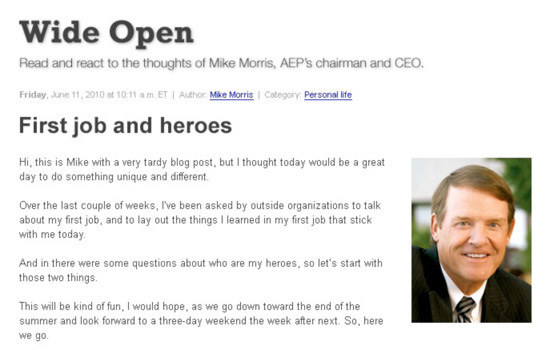 In 2004, William’s team wanted to launch a CEO blog on their intranet with comments open to all employees. While some executives supported the idea, others were apprehensive. 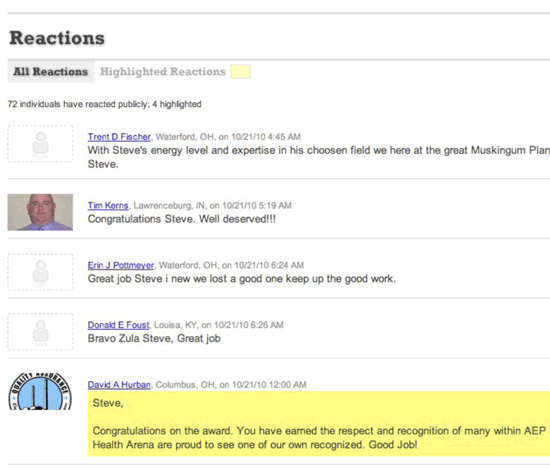 The idea that any employee could post a comment was new and sounded a little crazy. But it made perfect sense for William: if you respect employees, you have to give them a voice and be ready to listen. 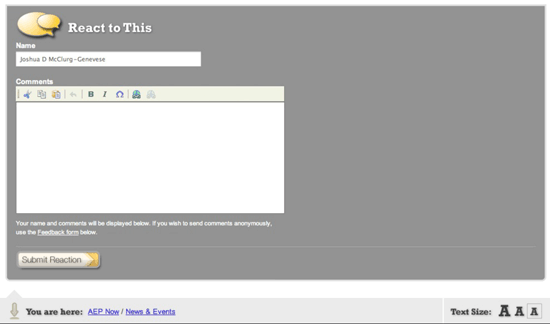 The CEO blog idea hit a dead end and they didn’t launch it. The idea just seemed too risky to too many. Those who were worried about losing control of the internal communications message prevailed. It was a frustrating moment for William and his team, who sought to build space for real dialogue on the AEP intranet. But times have evolved. Back in 2004, Facebook’s public launch was still two years away and Twitter was barely a glint in Jack Dorsey’s eye. Few had smartphones and the culture of online interaction was still young. William was convinced that making the intranet an interactive space for employee engagement was a crucial step and his team didn’t give up when the CEO blog idea first failed. Consumer technology changed people’s expectations and made commenting on the intranet more of the standard. 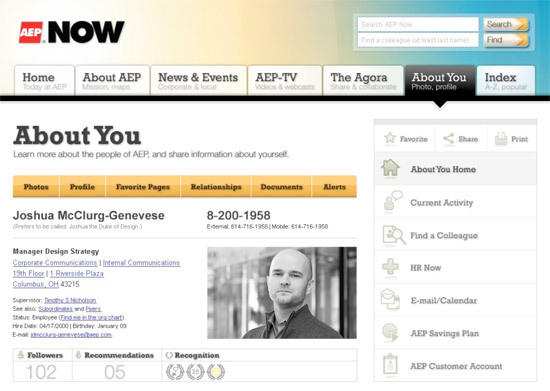 Today on AEP NOW every employee has a profile page, they get about 200 comments a day throughout the site, and an entire section of the intranet’s global navigation is dedicated to online community spaces. 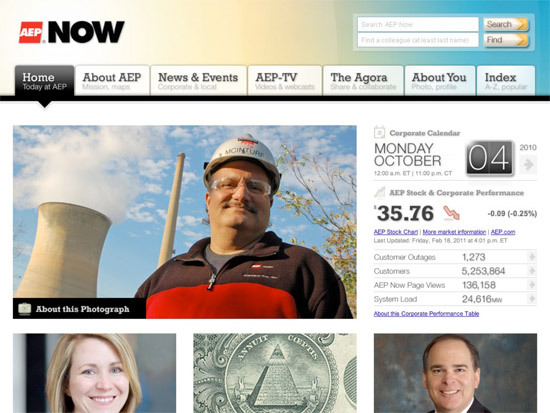 And because of those employee contributions to the intranet, AEP saved $18 million through their online ideas system and was recognized for it with an Intranet Innovation Award in 2009. This couldn’t have happened before the cultural shifts that laid the groundwork. Even if you’re not an intranet nerd like me, it’s fun to speak with William and see the passion behind his work. Many intranet managers who carry similar visions of the indispensible intranet can relate to his sense of purpose. But the most important lesson William learned was to be patient. “Preserve yourself to fight another day” was the parting wisdom he wanted to share with the bold crop of younger intranet managers who haven’t yet developed a deep reservoir of experience. An engaging, very human intranet isn’t just about technology or helping people get things done. While both those things are part of it, it’s really about doing right by your colleagues; it’s about building a meaningful, useful, enjoyable experience for fellow employees. William Amurgis isn’t a giant and he’s not a technical genius. He just believes in the value of people and continues to pursue the vision of an intranet built on respect.